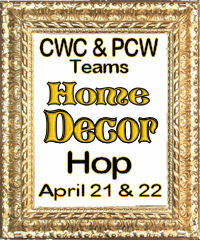 So glad you could join us once again for our Totally Terrific Two Day Home Décor or 3D Blog Hop! There are TWO DAYS with DIFFERENT DESIGNERS and DIFFERENT projects each day! PLUS we have a challenge and some great blog candy to give away too! In case you missed yesterday’s line up....simply CLICK HERE to go to yesterday’s post and check out the amazing work yesterday’s team did! So here is what I made for today. As a Christian, I am trying to reconnect with the Hebrew roots of our faith. I consider myself a crossed-over Hebrew. My Savior was a Rabbi and He taught us to keep the principles and teachings of the Word. One of those principles is the counting of the Omer. 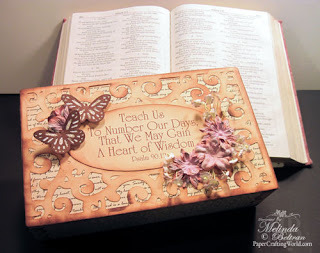 This is the time when you set aside some time each day to read a passage from Psalm 119 and reflect upon that. It is the 50 days between Pesach...Passover and Pentecost. It is a truly humbling experience. Did you know that Psalm 119 is the longest chapter in the Bible? 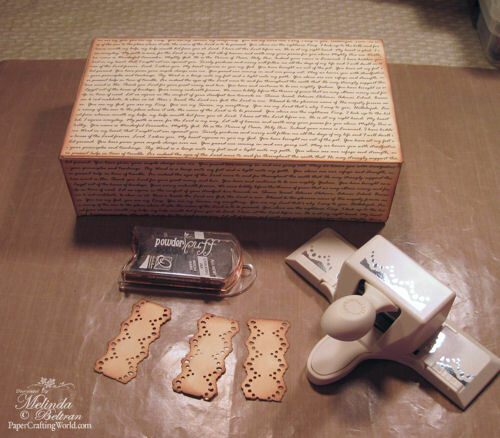 Did you know that each little subsection is entitled with a letter from the Hebrew Alphabet....Yep this is OUR BIBLE....Our TORAH :) So to keep track of this, I decided to create a box where I could print off the scriptures and keep them on the table for everyone in the home to take and read. Sometimes it is such a revolving door around here with school and work that at least everyone can do it on their schedule. I started with the plain box that I picked up at Michael's for .99. I printed out two sheets of the Exhortation background digital printable I created on cream colored paper. See below for free download. Next I measured the top and all the sides and cut the paper to each side. I inked the edges of the paper with some QQ Amaretto Chalk Ink. I adhered all the paper to each panel. I then punched out a strip of the same paper with my MS punch. I punched out on both sides of the strip. I inked the edges of them and adhered them to each corner. 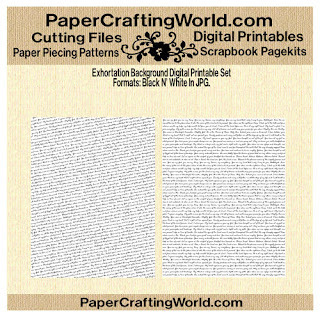 This was to give the appearance of some "hardware" but really to keep the edges of the paper from curling over time and use. Here is a close up of the "edges". Next, I cut out the Flourished Box Top-Rectangle Frame file that I created. I inked it very heavily to give it that vintage look. See below for free download. 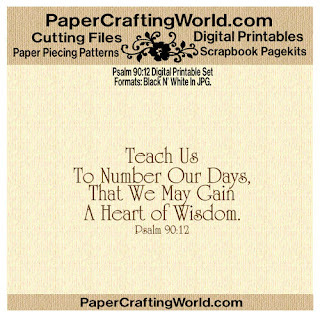 Then I printed out the scripture Psalm 90 verse 12 and then cut it out with my Pazzles. I Inked that and adhered it to the box top. See below for free download. Lastly, I added some Prima Flowers and some butterflies cut from my MS punch. So what would a hop be without some wonderful blog candy!!! There are several prizes and a few different ways to win!!! A Quick Quotes Prize Pack. This includes the Savvy Davvy Paper Pack featuring 12 double sided cardstock weight papers and 10 vellum quotes! Please note: This only ships within the United States. and you could win a $15 dollar gift certificate to Page-Kits.com. Please note: This only ships within the United States. Join our Home Décor Challenge and link up your home décor project below and you could win. Just link up on yesterday's post or below this one. Now how about a little something for everyone....Here are a couple of FREE files for you to enjoy. Be sure to download them today as they will only be available through today! Click Button and add to cart. It will not cost anything to download today. 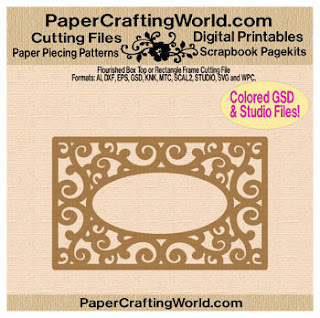 Box Top - Rectangle Flourished Frame Cutting File. Available in: AI, DXF, EPS, GSD, KNK, MTC, STUDIO, SCAL2, SVG and WPC formats. Click Button and add to cart. Sorry Free File Expired. Only $1.00 to purchase. Now on to the wonderfully talented Becky to see what she has in store for you! Melin I love the aged look of print under your lacy cut, and the way you inked the paper. Looks so beautiful! Melin, I love this project and the idea behind it. Thanks for the wonderful information you have added into your post, very interesting. Beautiful!!! Love the lacy cuts and all the amazing details! 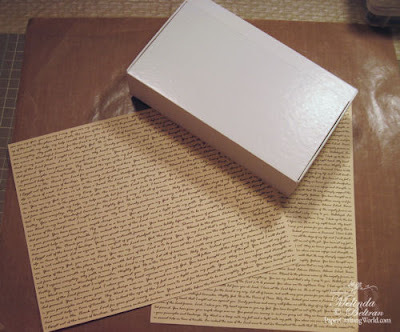 Great idea and I love the box!! Thanks for the details of what you made the box for. Very interesting! Beautiful box. I especially love the way you layered the paper. The colors are gorgeous! Just stunning! Thanks you for the freebies! Absolutely love the idea and the creation. Am already planning to do something similar for us. Melin, this is just beautiful. I love the idea behind the box. The entire project is amazing. Your work is fabulous. Thank you for being so generous! You ROCK!! Just beautiful! Very creative. Love the scripture you put on it and the meaning with the family to have readily available for all to see. Great job! 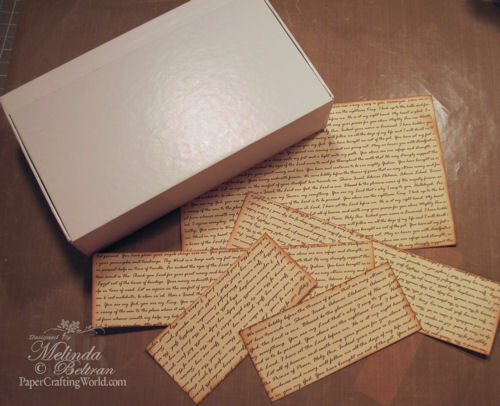 What a lovely box and idea. Great idea. Going to share this with my daughters for their families. The box is absolutely gorgeous. This is beautiful. . .a project I will be definitely doing. Thanks for the downloads! The box is gorgeous and you made it look easy to do too. Melin this is BEAUTIFUL!!! I LOVE it!!! I just love this and I can see the same idea made into a card! I can't wait to try it. 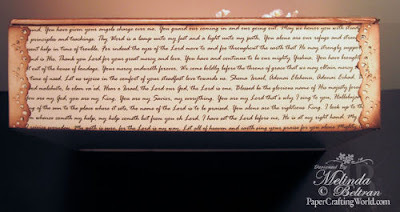 Simply beautiful, I would love to make one of these, just to keep the promises of GOD in them, awesome! I love your box. Thanks for all the free files. Love your box. Just wonderful!!! Thanks for the freebies. I am a follower and fan on Facebook. Thanks for the chancwe to win. 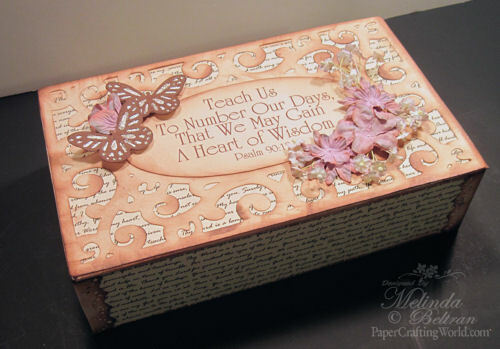 What a great idea and your box is gorgeous!!! I love it! I absolutely love your project Melin! As usual, you have wowed me! TFS and be a wonderful DT Leader. Scrappy hugs and have a wonderfully blessed day! Great box. I will have to try making one. 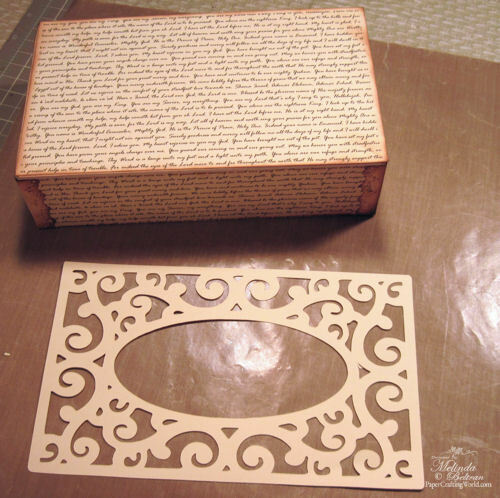 Thanks so much for these files -- I am making boxes for my Bible Study group. What a magnificent idea! Love Psalm 90:12! Thank You for sharing you wonderful files.....so many way to use them! What can I say but that this project is absolutely beautiful!!! I love everything about it!! That scripture is one of my favorites!! Thanks for all you do!! Your project is so beautiful and I love all the detail work and patience you have put into it! Just lovely!! Such a beautiful card. Thank you so much for sharing theset vetrisha@gvtc.comry meaningful and lovely files. Lovely details. great project. thanks for the instructions. i'm a follower and a fb fan.